In the past two years I’ve travelled a lot, on average about a week a month. I usually take about six books with me if I’m away for a week, but I also started reading books on my laptop, just to have more variety. But my laptop is heavy and not comfortable for reading in a hotel bed. Then I realized that it might be a smart thing to buy a dedicated e-reader. I’m a reader, and I’ve got about ten thousand books, but I’m not a bibliophile, I don’t care about first editions, for instance. But which one? Kindle was out of the question, since I don’t want Amazon to be able to track or even delete my reading habits. I also am quite sure that I will carry around a lot of books, so I wanted to have an SD card slot. And if the device is hackable, that’s a plus. I’ve had it for a month now, there are about 500 books on the device, I’ve spent quite a few hours with it and I’ve learned what this kind of device is good for, and what it isn’t suitable for. In short, it’s great if you want to read a novel from cover to cover, and it’s atrocious if you’re actually someone who uses books. An advantage or disadvantage is that nobody can see what you are reading: no more peeking around you on the plane or train to see what people are reading, no more smiles of understanding between two Terry Pratchett lovers. On the other hand, since nobody sees what you are reading, no longer sharp remarks about being a poser who is just trying to impress if you accidentally happen to be reading Donne. Or sad looks about your lack of taste if you happen to be reading 1634 by Eric Flint. Technically, my Sony PRS T1 is pretty ok. There are some bugs, especially in the touch screen which is prone to getting confused and will then turn dozens of pages in a quick succession, but nothing too serious. The screen is good, though a the white is bit too gray, and it’s too small. They tell you that your e-reader will be the same size as a paperback, but that’s only true if you count the bezel and buttons. There’s much less text on the screen than there’s on a page of a real book. I like the fact that this device has real buttons to go to the next and previous page — I find that easier to use than the screen gestures. The touch screen keyboard is pretty good, very usable. The back is rubberized for good grip, and I wish the front was as well, but it’s shiny plastic. Not so good. The whole device feels a bit cheap, which is actually a good thing, because it means I don’t feel forced to be too careful with it, even though it cost 150 euros. I pop it in my coat pocket or backpack, carry it everywhere. Battery life is wonderful, and for reading long stretched of text it’s great that I can change the font size. When I read in bed without my glasses, I can make it small, when I’m using my glasses it needs to be bigger. But the choice of fonts is pretty limited. It’s pretty easy to add new books from Linux, I don’t even use Calibre for that, I just copy them to the right location on the device. And Project Gutenberg is stuffed with the kind of thing I like to read. 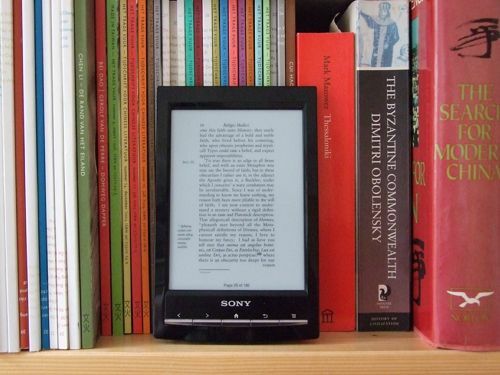 The thing is, this e-reader is nearly good enough. It’s tantalizing. Already ten years ago I was dreaming of a device close to this one. But an e-reader made for serious users of books. It should have a bigger screen, at least A5, but color isn’t necessary. it should come out of the box reasonably well-formatted copies of all the classics, from the Odyssey to the Hypnerotomachia Poliphili, from Jane Austen to Kalidasa, from Mengzi to Layla and Majnun, both in the original language and in an English translation, and a way to show both in parallel. The text should be searchable, but there should also be some serious smartnesss in that search facility: I want to be able to select a passage and nearly immediately get a list of places from which that passage can be a quote and where that passage is quoted. Wikipedia integration is great, but selecting a name should give me a list of all works where that name occurs. A chapter quote should link to that book, as well as books about those books. There should be a serendipity feature, where browsing through the list of available books is replaced by “give me something that suits my mood” or “give me fiction about Tipu Sultan”. More and better fonts. I want to have Bodoni for my French books, Bembo for my books in Italian and Caslon for my books in English. I got a copy of Mengzi on my Sony, but there’s no Chinese font! It should be much easier to have a set of books open at the same time — instead of having just one open and the rest remember their current page. Opening a new book doesn’t mean closing the other one! Text to speech — especially in the dictionary, especially important for English, which does pose some challenges for a foreign reader. Next Next post: Jiffy Bag Time!